Two bedroom townhouses offer three floors of living space. 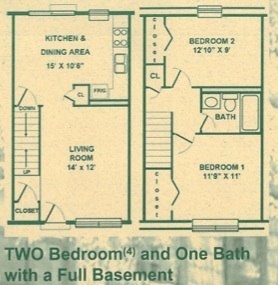 They feature two bedrooms with a full bathroom upstairs. The living room and kitchen with a dining area are located on the main floor with a patio door off the kitchen. They also feature a full basement. The basement has hookups for a full size washer and dryer, with plenty of storage space. The two bedroom townhouse offers approximately 900 sq. feet.